The difference between this Saigon bike excursion and the previous ones is that it’s rainy season. That meant when I (inevitably) got lost looking for my lunch restaurant, my search for the right street took on a new sense of urgency. Nothing like thunder and a pre-downpour sprinkle to focus the mind. 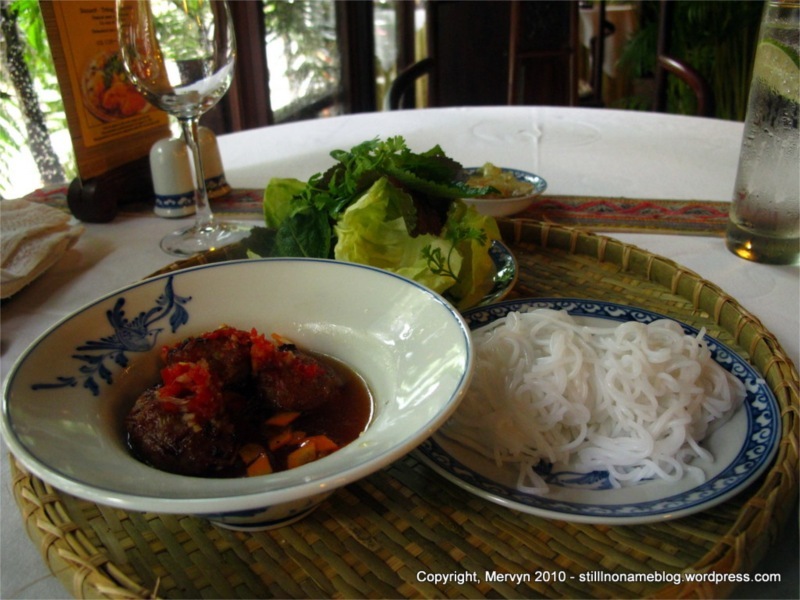 A few wrong turns, a detour down a one-way street, and fifteen four-letter words later, I ducked out of the drizzle into Hoi An, an upscale restaurant located near the upscale part of town. 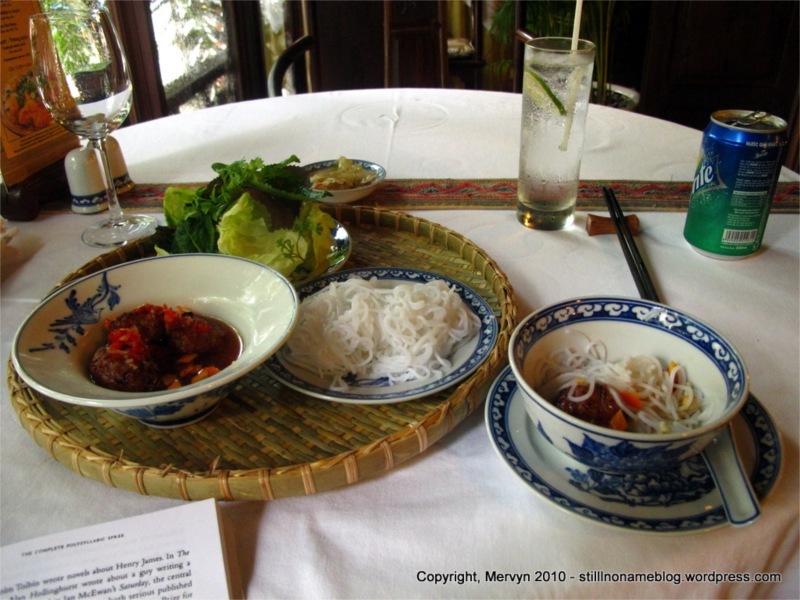 I was there to get a taste of my favorite Hoi An fare (the town, not the restaurant). I wasn’t expecting Mango Rooms’ Eastern Fortunes or anything earth shattering. I was hoping for, you know, something akin to a cleaned up Bale Well or a sanitized White Rose. No dice. The menu had none of my favorites. In the end, I opted for the set menu and some bun cha, mostly to see if someone could show me how I was supposed to eat the stuff. First up, though, the appetizers. The three set items came out in the most over the top, ridiculously proportioned setting I have ever seen. The restaurant had slaughtered half a watermelon, five carrots, and a bushel of parsley in order to “garnish” three bite size apps. As the waitress lugged it over and plopped it on my table, I kept looking around to see if others were gawking. I was. The garnish was so outlandish that, I can now barely remember the apps inside. 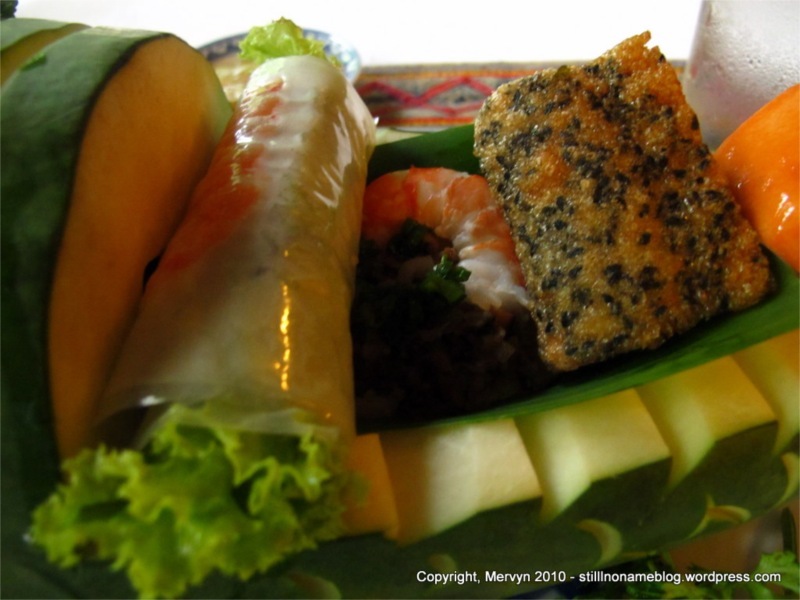 I do know one was a spring roll, one a shrimp (something? ), and the other a rice/sesame/black meat thingy. I also know they were good. 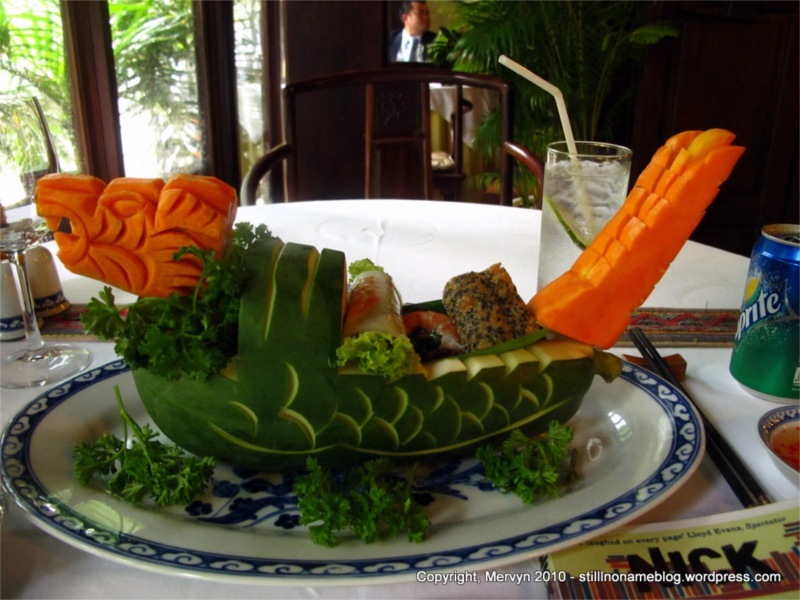 Can’t get over the vegetable and fruit warship, though. Looked like the start of a mini-fleet for hippie vegetarian Vikings acid addicts. 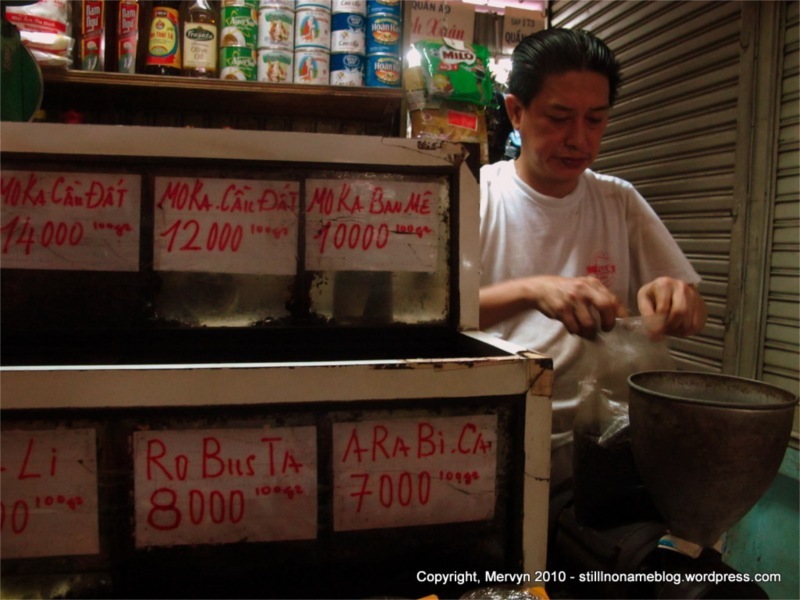 The bun cha was much more straightforward. I accepted the waitresses offer to show me how to eat, of course. Turns out you use the bowl to combine a portion of noodles, meat, and sauce. 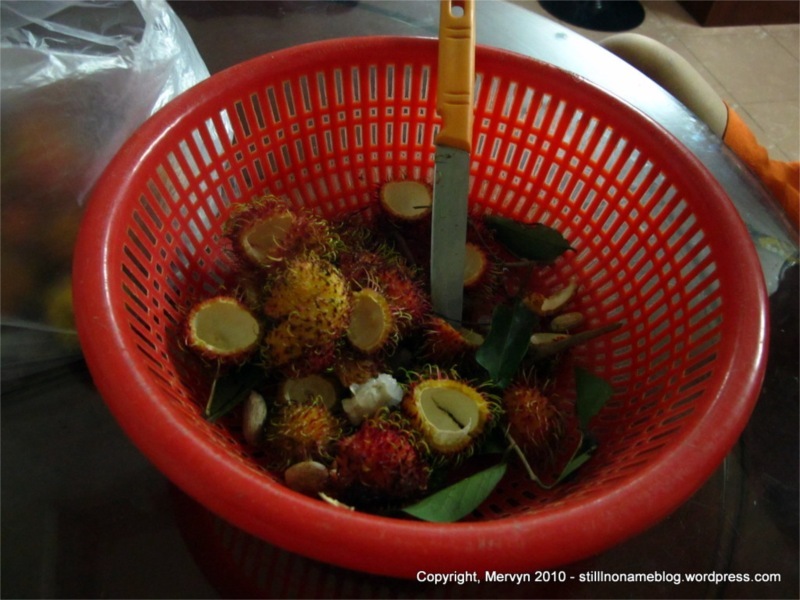 Then you eat that while picking at the pile of vegetables to add fresh crispness to each bite from your bowl. Repeat as necessary. Stupidly simple, actually. I finished off the meal with a set dessert. Cheese cubes (I think), slivered almond-like nuts, pandan flavored gelatin, and some unknown other gelatinous matter all soaked in a light sugar syrup. Despite its unknown origins, I liked it a lot. 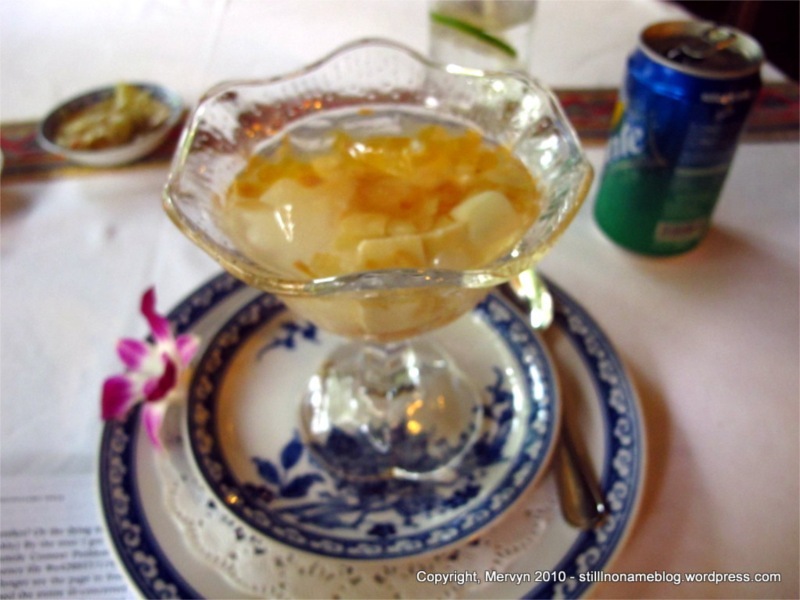 As with most Asian desserts, it was sweet, but not too sweet. I nursed my dessert until the storm passed. Rain done for the day, I hopped back on the motorbike and went shopping for Vietnamese coffee. At the advice of a local friend, I skipped the Ben Thanh market (“overpriced”) headed for the Thai Binh market instead (“much cheaper”). The coffee vendor was all too delighted to dip into my Western wallet. 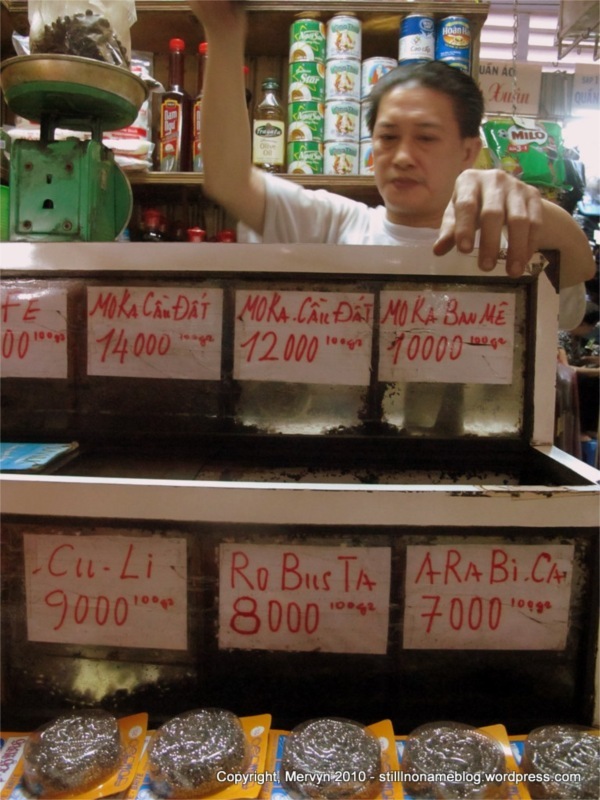 I negotiated what I thought was a good price for a good blend of beans (110,000 dong/kilo). I ordered a lot so he threw in a bag of green tea and upgraded my beans to more expensive stuff all for “free.” If I was getting ripped off, I couldn’t tell. To me it was a fantastic price. Plus, any time I miss Vietnam, I can jolt my system with a killer coffee buzz. It didn’t stop there, though. 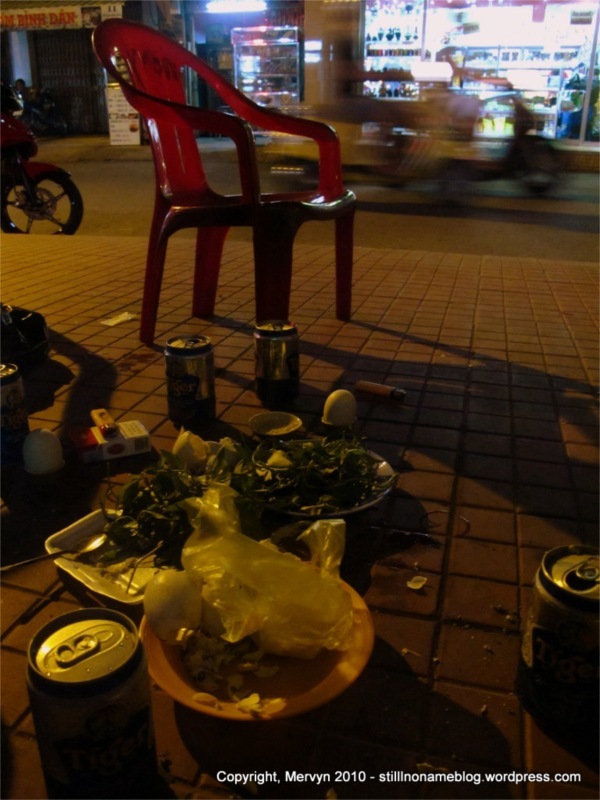 Later that evening, the guys reconvened and I joined them for a rush of street food. 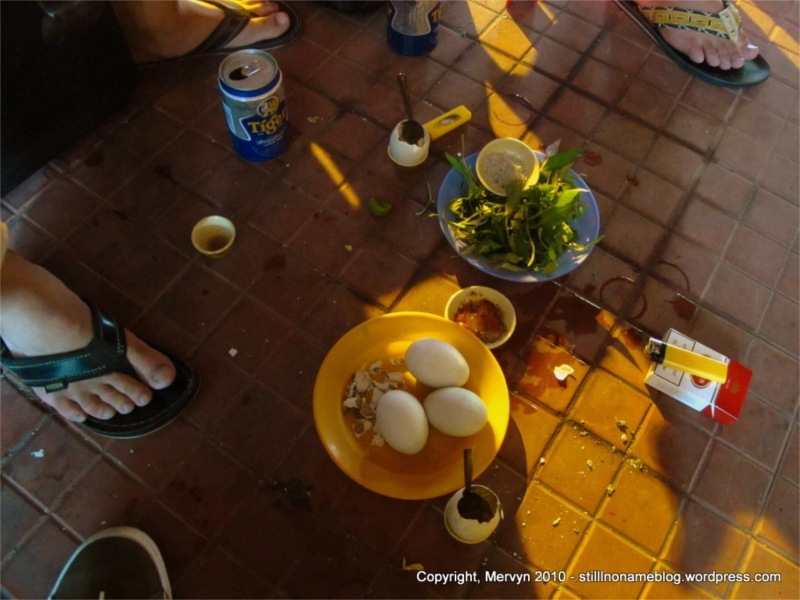 It was both my and my friend’s last night in Saigon, so we splurged on a couple rounds of beer and a whole mess of balot. It felt like a replay of a night on this same doorstep almost two months back except more of everything. I powered my way through two eggs. Then I discovered there’s more than one kind of balut. The first two I’d had were fully fertilized. The second, novel pair (hot vit lon) that I ate was “not all done.” I have no idea what this means, because no one could explain it in English. 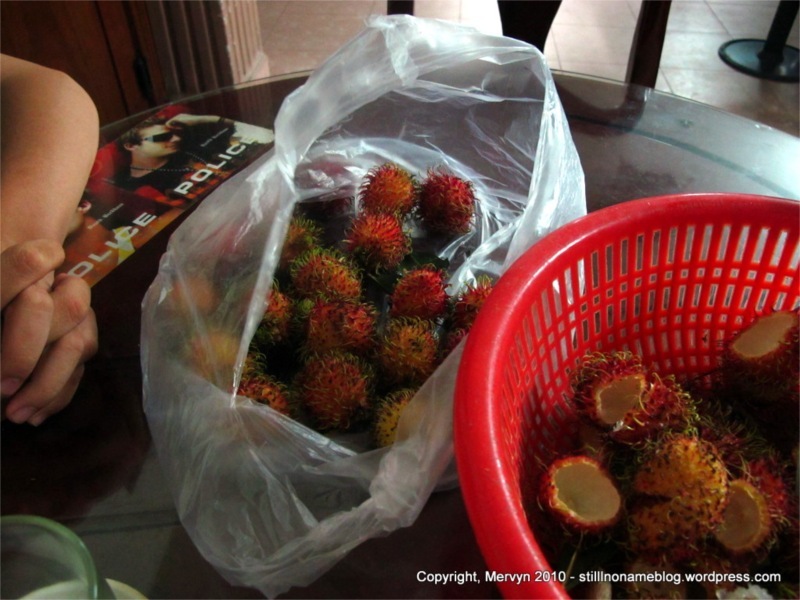 To me, these were more juice than meat. It was mostly egg white. Mercifully, they were less filling than the first two. More delicious, too. I couldn’t even tell they were fertilized. 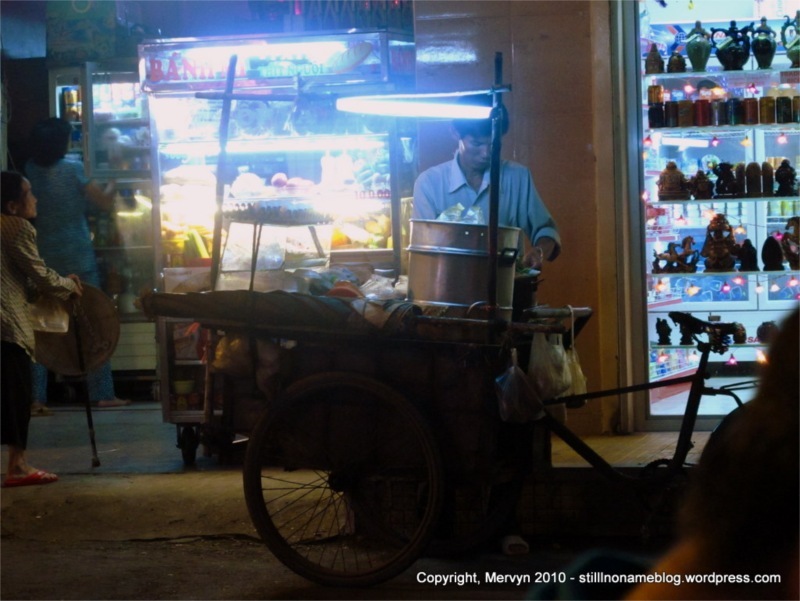 Best of all, they were cooked up by a man using a cooking station jerry-rigged onto the back of a bicycle. It’s no use pretending that this fact didn’t make it taste even better. God I’m going to miss street food. Just when I thought I was done, the guys called over a lady shouldering a bamboo pole with a load of merchandise hanging from each end. 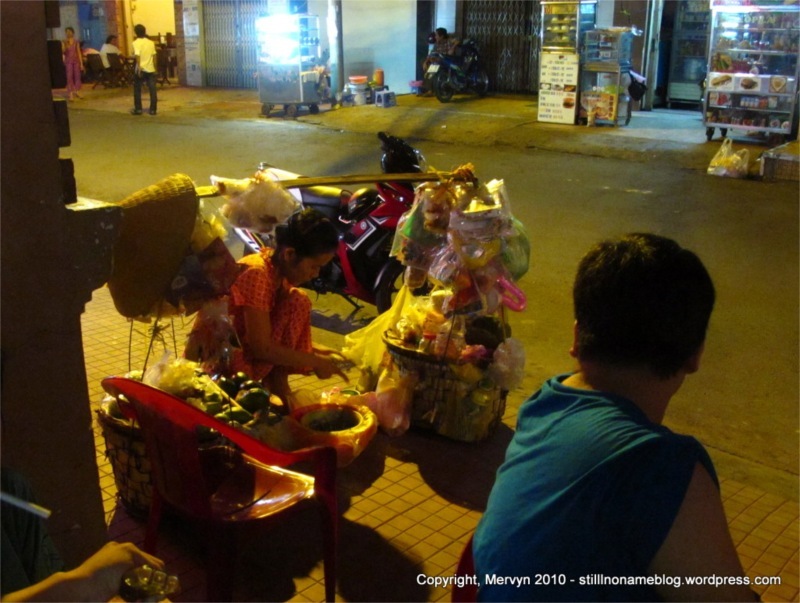 She proceeded to spend the next 10 minutes (no kidding) squatted by the sidewalk, snipping at vegetables, herbs, and dried noodles. In the end, she handed us three plastic bags filled with noodles softened in oil mixed with fresh veggies. I ate it by stabbing pieces with a bamboo skewer. It was delicious, but I was so full of various types of baby duck and beer that I couldn’t finish. My two younger companions laughed at my feeble appetite. I used to eat like these guys when I was in my early twenties, too. Now, bloated with tasty foods, that eating era felt like a decade ago, which I guess it was. My friends shooed me upstairs to pack. It was 2 a.m. and I had to leave for the airport at 7 a.m. to make my flight. I bid them a hearty good night and thanked them for a grand send off. I miss Vietnam already. I need that cup of coffee, stat. GALLERY: Click through to see the pics above plus a bonus picture of Mervyn too stuffed to finish his bag of noodles. The last time I remember eating like that was in high school…..I loved it all going down, and then suffered for hours as it tried to make its way THROUGH!! As I recall, it involved a lot of pizza, and the fat in the cheese REALLY slowed down the system….of course, the saltiness of the fare led to a lot of soda pop-drinking, and OY VEY, I was stuffed!! Taught me a lesson, too….doggy-bags are us! Probably not something do-able on the street in Vietnam, though.